1. The fitted crib sheet. Now this. This is what inspired the whole room. (Thank you, Pottery Barn Kids.) I’m in love with the unfinished-coloring-book look of the Wildflower design. Because of the risk of SIDs, we’re opting out of a bumper. I ordered three fitted crib sheets, and that should about do it. We may add a breathable bumper, but I really don’t think it’s necessary. So, at twenty bucks a pop, our total bedding bill came to about $60. 2. The paint color. I’m pretty sure I’ll go this dark with the gray, since everything else is bright, white and cheery. Whaddya think? These fun polaroid frames I snagged at Urban Outfitters will really stand out against the dark gray. I also love that we’re not painting the nursery the traditional pink or blue. 3. A homemade mobile. I want to make a homemade mobile like John and Sherry’s at Young House Love. I think it’s adorable, and frankly, I’m just not that wild about the ones sold in stores. 8. The dresser, which doubles as a changing table. Again, super simple. 9. Soft, ruffle pillows. I love the contrast of these sweet, feminine pillows with our masculine, leather nursery chair. The yellow ruffle pillow is available on Etsy, and I may just have to have it! Finally, I forgot to include this idea in the mood board, but I pinned these canvas + wood letters on Pinterest. Wouldn’t it be fun to make these with her name above the bed? Again, the crisp white would just jump off the gray wall. Next Post Garage sale success! 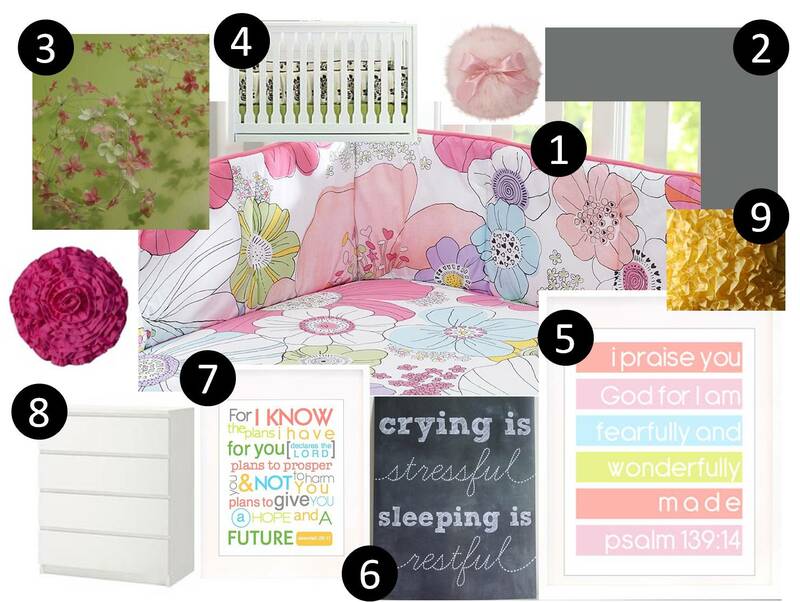 Love it all, your baby will be blessed to have such a creative, beautiful space to live in! !